The trail was hand-built before 1825 for horseback and foot travel between Wailuku and Lāhainā; it served as the most direct route across the steep southern slopes of West Maui Mountain. Around 1900, the Lāhainā Pali Trail fell out of use when prison laborers built a one-way dirt road along the base of the pali. In 1911, a three-ton truck was the first vehicle to negotiate this road, having a difficult time making some of the sharp, narrow turns. Over the years, the road was widened and straightened until 1951, when the modern Honoapiʻilani Highway cut out many of the 115 hairpin curves in the old pali road and a tunnel cleared the way through a portion of the route. Today, a remnant of the old trail is a recreational hike – five-miles long (from Māʻalaea to Ukumehame) and climbs to over 1,600-feet above sea level. The trail runs from a point Kahului side of Māʻalaea Harbor, over a ridge and down to a long, sandy beach with snorkeling, surfing and picnicking facilities. Ranging in elevation from 100-feet to 1,600-feet, the trail offers excellent scenic vistas of Kahoʻolawe and Lānaʻi islands. Whales can be observed during the winter months. Petroglyphs, stone walls and rocky outcrops mark the spots where long ago travelers stopped to rest. 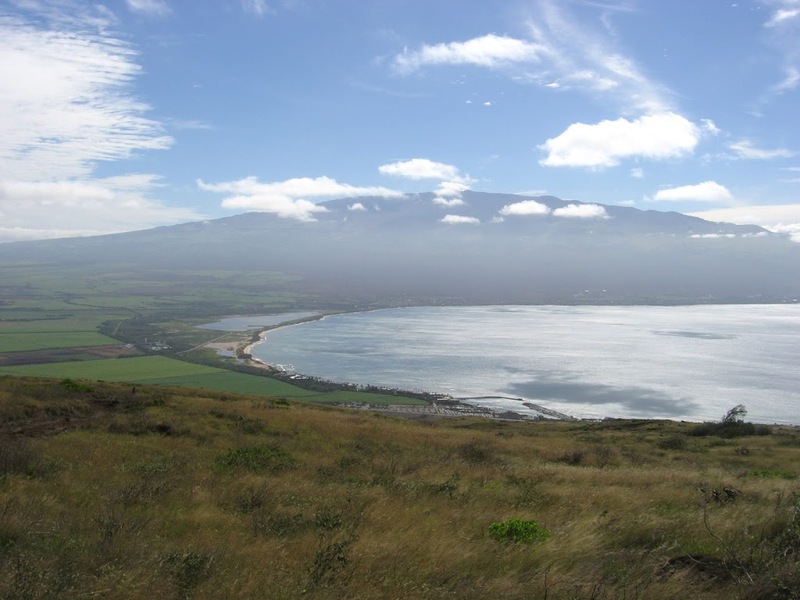 The mid-point of the trail is Kealalola Ridge, the southern rift zone of the volcano that formed West Maui. Pu’u (cinder hills) and natural cuts in the ridgeline expose the dramatic geologic history of this part of Maui. The Lāhainā Pali Trail is a historic roadway. Damage to the trail or any archaeological sites along the trail is subject to penalties, as defined in Hawaiʻi Revised Statutes Chapter 6E. Directions: Both trail heads are accessible from Honoapiʻilani Highway. The eastern trail head is 0.2 miles south of the junction of Honoapiʻilani Highway and Kihei Road . The western trail head lies 1- mile south of Lāhainā and 3 miles west of Māʻalaea Harbor. The parking area is accessible from Highway 30 at Manawaipueo Gulch about 0.25-mile north of the Pali tunnel. Click Here for a brochure “Tales from the Trail” on more history and information about the Lāhainā Pali Trail. The image shows a view of Māʻalaea, Keālia and Haleakalā from the Lāhainā Pali Trail; in addition, I have added related images in a folder of like name in the Photos section on my Facebook and Google+ pages.